In this stunning sequel to the highly acclaimed paranormal fantasy--Daughter of Smoke & Bone--Karou must decide how far she'll go to avenge her people. 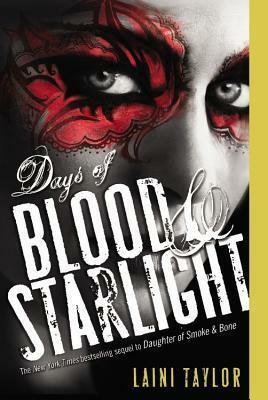 Filled with heartbreak and beauty, secrets and impossible choices--Days of Blood & Starlight--finds Karou and Akiva on opposing sides as an age-old war stirs back to life. While Karou and her allies build a monstrous army in a land of dust and starlight, Akiva wages a different sort of a battle: a battle for redemption. But can any hope be salvaged from the ashes of their broken dreams? Laini Taylor is a New York Times bestselling author and a National Book Award finalist. She is the author ofStrange the Dreamer and the global sensation the Daughter of Smoke & Bone trilogy: Daughter of Smoke & Bone, Days of Blood & Starlight, and Dreams of Gods & Monsters, and the companion, Night of Cake & Puppets. She is also the author of the Dreamdark books Blackbringer and Silksinger, and the highly acclaimed Lips Touch: Three Times. She lives in Portland, Oregon, with her husband, illustrator Jim Di Bartolo, and their daughter Clementine.